Ladislas Lazaro was born on June 5, 1872, on the Lazaro plantation near Ville Platte, Louisiana, in St. Landry Parish, part of which is now Evangeline Parish.2 Lazaro was the child of Marie Denise Ortego, a daughter of one of Ville Platte’s founding Hispanic families, and Alexandre Lazaro, an émigré from the town of Risan, in what is now Montenegro in the Balkans.3 The family lived on a plantation, which Lazaro’s father farmed. When Ladislas was 12 years old, his father died; his mother then moved the family into Ville Platte. Ladislas Lazaro’s lifelong friend René Louis De Rouen observed that Lazaro had a middle-class upbringing and was surrounded by local boys from similar stations in life, “neither very rich nor poor,” knowing of “no hunger that he was not sure of satisfying and of no luxury which enervates the mind or body.”4 Lazaro attended local public and private schools in St. Landry Parish. He attended St. Isadore’s College (a preparatory school now named Holy Cross High School) in New Orleans. In 1894 Lazaro graduated from the Louisville Medical College in Kentucky and began practicing as a family physician in Washington, Louisiana, a hamlet 15 miles southeast of Ville Platte. Lazaro married the former Mary (Mamie) Curley of Lake Charles, Louisiana, on December 21, 1895.5 They raised three daughters—Elaine, Mary, and Eloise—and a son, Ladislas, Jr. Lazaro’s medical practice thrived at the turn of the century, and he eventually was chosen by his colleagues to serve as first vice president of the state medical society in 1907. In 1912 Representative Arsène Pujo, a Lake Charles lawyer who served five terms in the House and rose to chair the Banking and Currency Committee when Democrats gained control of the chamber in 1911, abruptly announced that he would not seek re-election to a sixth term.8 The district he represented, then Louisiana’s 7th Congressional District, encompassed eight parishes in southwestern Louisiana, stretching eastward from the Texas border to the southern center of the state—including Opelousas and Lake Charles (the latter had roughly 11,500 inhabitants according to the 1920 Census)—and terminating 50 miles west of the state capital of Baton Rouge. It was the least-populated congressional district in the state, with just over 165,000 inhabitants, and it overlapped the parishes that composed Lazaro’s state senate district. Primarily rural, the district had an economy that was mainly agricultural; its chief crops were rice and cotton. The 1927 Radio Bill marked Lazaro’s legislative swan song. Late in the 69th Congress (1925–1927), Lazaro’s health deteriorated, eventually necessitating abdominal surgery. Following an operation on March 9, 1927, Lazaro seemed to make a strong recovery, but then his condition worsened, and he died on March 30 at Garfield Hospital in Washington, D.C., of complications from an abscess. Word of his death shocked political observers and friends alike, most of whom were unaware of the severity of his illness. The Clarion-Progress of Opelousas mourned, “A pall of gloom overhangs St. Landry parish at the loss of its beloved statesman, citizen, and friend.”41 Condolence letters and telegrams flooded the Lazaro home in Washington, D.C. “Death intervened to end untimely a public career of genuine usefulness,” observed the New Orleans Times-Picayune, adding, “Louisiana has no representative at the national capital more loyal than he, and both the state and his district were given many proofs of his devotion to their interests. His passing is therefore accounted a serious loss to the commonwealth and will be widely and sincerely mourned.”42 Befitting Lazaro’s position as dean of the Louisiana delegation, a large congressional party escorted his body by train to Opelousas, where thousands of mourners waited. Lazaro’s passing was a personal loss to many in his home parish, distinct from the political void left by his absence. On the 20-mile ride north to Ville Platte, those in the funeral entourage were awestruck by the outpouring of “grief … unmistakably manifested everywhere.” The district’s numerous farmers and their families, many of them Lazaro’s former patients, lined the route, and students and faculty stood outside each schoolhouse to pay their respects as a funeral procession of more than 300 vehicles wound along the highway. “Never have I seen anything like it—mile after mile on public roads, vehicles of all kinds carrying people bowed down with grief, not one of them in the spirit of curiosity, but genuine sorrow and regret,” recalled Representative James Z. Spearing of Louisiana.43 Lazaro was interred in the Old City Cemetery in Ville Platte. 1As only the second Hispanic Representative in Congress—after Romualdo Pacheco of California, who served from 1879 to 1883—Lazaro was also only the second Hispanic Member who was eligible to chair a committee. 2The area had been settled by persons of French and Spanish origin in the late 1700s and lay on the edge of the Mamou Prairie, from which the town took its name. Ville Platte, derived from the French for “flat town,” was incorporated shortly before the Civil War and eventually lay along the Texas and Pacific Railway. Clare D’Artois Leeper, Louisiana Places (Baton Rouge: Legacy Publishing Company, 1976): 246. 3Sources are inconclusive about whether Lazaro had any siblings. At least one internal memo in Lazaro’s files, discussing the disposition of his House salary upon his death, referenced a sister named Belle. See the untitled memorandum of 22 December 1922, C-38, Congressional File, Box 3, Folder 27, October–December 1922, Papers of Ladislas Lazaro, Louisiana and Lower Mississippi Valley Collections, Louisiana State University, Baton Rouge (hereinafter referred to as Papers of Ladislas Lazaro). No other biographical sources, including Lazaro’s obituaries, list siblings. Information on Lazaro’s paternal relatives is included in a long letter from his cousin Lazar Popovich. See Papers of Ladislas Lazaro, Popovich to Lazaro, 10 April 1922. 4De Rouen was born in Ville Platte and was two years Lazaro’s junior. He succeeded Lazaro in a special election on August 23, 1927. 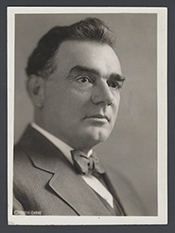 His reminiscences are included in a set of memorial addresses for Lazaro delivered on the House Floor in May 1928. See Congressional Record, House, 70th Cong., 1st sess. (13 May 1928): 8589. 5Glenn R. Conrad, ed., A Dictionary of Louisiana Biography: Vol. I, A to M (New Orleans: Louisiana Historical Association, 1988): 493. 6Speeches from Lazaro’s first Louisiana senate campaign can be found in the Papers of Ladislas Lazaro, C-37, Congressional File, Box 1b, Folder 1: 1907–1913. 7Papers of Ladislas Lazaro, C-39, Typewritten Speeches and Speech Notes, n.d., Box 6, Folder 52, undated biographical profile of Lazaro. 8Pujo, who was also in charge at the time of an influential special committee looking into the trusts and financial combinations—which received much press attention in an election year—told the press he was retiring because he was “sick” of the election cycle and the pace of Members’ lives. See, for example, “43 in House to Retire,” 2 September 1912, Baltimore Sun: 9; and William L. Altdorfer, “A Startling Exodus of Statesmen from Public Office,” 5 May 1912, Washington Post: SM4. 9As Lazaro told constituents, he unreservedly endorsed “Federal control and support of levees; tariff for revenue, limited to the necessity of government conducted honestly and economically and with efficiency; a revision of the tariff in the people’s interest without injuring any legitimate industry; a tariff on rice, sugar and lumber; the full exercise of the state of their reserved power; the income tax; publicity and curtailment of campaign expenses; primaries in selecting residential candidates; the election of the United States Senators by the people; vocational and agricultural education; good roads and drainage; a department of labor represented in the President’s Cabinet.” Papers of Ladislas Lazaro, C-37, Congressional File, Box 1b, Folder 1: 1907–1913. 10V. O. Key, Jr., Southern Politics in State and Nation, 2nd ed. (Knoxville: University of Tennessee Press, 1977): 156–182. 11“Circular Sent Causes Anger—Brings in Religion,” 2 September 1912, The Daily-Picayune (New Orleans): 3. 12“Lewis and Lazaro,” 6 September 1912, The Daily-Picayune (New Orleans): 1, 10. Local newspapers speculated that the race might be close enough to force a runoff primary on September 24, 1912, but there is no evidence that a runoff was ever held. 13Of the Hispanic representatives whose careers ended before World War II, only Félix Córdova Dávila, a Puerto Rican Resident Commissioner, served longer in Congress. Dávila was in office roughly eight months longer than Lazaro. Dennis Chavez of New Mexico served two terms in the House (1931–1935) before being appointed to a vacancy in the U.S. Senate in May 1935, winning election to the remainder of the term, and being re-elected four times. He served until his death in 1962. 14Enrolled Bills Committee chairmanship and composition information in Congressional Directory, 64th Congress (Washington, D.C.: Government Printing Office, 1916): 185; Congressional Directory, 65th Congress (Washington, D.C.: Government Printing Office, 1917): 187. Lazaro was just the second Hispanic American to chair a standing congressional committee; Romualdo Pacheco was the first. 15Charles Stewart III, “Committee Hierarchies in the Modernizing House, 1875–1947,” American Journal of Political Science 36, no. 4 (November 1992): 835–856; see especially Stewart’s table on “Committee Attractiveness,” p. 845. Created in 1887, the Merchant Marine and Fisheries Committee had gradually acquired jurisdiction over a wide range of maritime matters, including all policy affecting water transportation, shipping and shipbuilding, registering and licensing vessels, navigation, the Coast Guard, lighthouses, the Panama Canal, and, eventually, regulations governing radio communications. See, for example, Kathleen A. Dolan, “Merchant Marine and Fisheries Committee, House,” in the Encyclopedia of the U.S. Congress, vol. 3 (New York: Simon and Schuster, 1995): 1391–1392. 16The Agriculture Committee was a prominent assignment at this point and seemingly an attractive panel for a Member from a rural district. There is no mention in any of Lazaro’s existing papers or in press accounts that he sought a seat on the Agriculture Committee, which typically was dominated by Southerners. Only a handful of Louisianans served on the panel in the first half of the 20th century, and only one (James Aswell) served during Lazaro’s tenure. 17For more information on the reapportionment battle during the 1920s, see Charles Eagles, Democracy Delayed: Congressional Reapportionment and the Urban-Rural Conflict in the 1920s (Athens: University of Georgia Press, 1990). 18“Election Statistics, 1920 to Present,” http://history.house.gov/institution/election-statistics/election-statistics/. For results prior to 1920, see Michael J. Dubin et al., U.S. Congressional Elections, 1788–1997 (Jefferson, NC: McFarland & Company, Inc., 1998). 19References to the campaign can be found in the 20 August 1916, New Orleans Times-Picayune: C4. 20“Edwards Attacks Lazaro’s Record,” 24 August 1916, New Orleans Times-Picayune: 5. 21For results, see the 15 September 1916, New Orleans Times-Picayune: 3. 22Lazaro’s correspondence does not indicate that he ever seriously considered a run for statewide office. 23Ladislas Lazaro to Albert Tate, 14 June 1924, Papers of Ladislas Lazaro, Box 4. 24Letter of 4 May 1926, Lazaro to Harry F. Knapp, Papers of Ladislas Lazaro, C-40, Congressional File, Box 8, Folder 81, MS 1113. 25Congressional Record, Appendix, 63rd Cong., 1st sess. (28 April 1913): 16–18. For more on Congress and tariff policy throughout U.S. history, see Robert W. Barrie, Congress and the Executive: The Making of U.S. Foreign Trade Policy, 1789–1986 (New York: Taylor & Francis, 1987); Robert W. Barrie, “Tariffs and Trade,” in the Encyclopedia of the U.S. Congress, vol. 4, Donald Bacon et al., ed., (New York: Simon and Schuster, 1995): 1909–1923. 26Congressional Record, House, 63rd Cong., 1st sess. (30 September 1913): 5274; “Tariff Bill Passes House, 254 to 103,” 1 October 1913, New York Times: 1. 27Christopher M. Lee, “Organization for Survival: The Rice Industry and Protective Tariffs, 1921–1929,” Louisiana History 35, no. 4 (Fall 1994): 454. 28Lazaro to I. N. McCollister, 2 June 1924, Papers of Ladislas Lazaro, Box 4; Unaddressed Letter from Lazaro to “Dear Friend,” 24 June 1926, Papers of Ladislas Lazaro, Box 5. 29For more on the McNary–Haugen legislation, see Darwin N. Kelly, “The McNary–Haugen Bills, 1924–1928,” Agricultural History 14 (1940): 170–180; Steve Neal, McNary of Oregon: A Political Biography (Portland: Oregon Historical Society, 1985). 30Ladislas Lazaro, “The High Cost of Living,” Congressional Record, Extension of Remarks, Appendix, 64th Cong., 2nd sess. (27 February 1917): 553. 31Congressional Record, House, 66th Cong., 1st sess. (8 November 1919): 8152. 32See Stathis, Landmark Legislation: 181. The act was named for Senator Wesley Livsey Jones of Washington state, chairman of the Senate Commerce Committee, http://bioguide.congress.gov. For more on the act, see Michael McClintock, “Merchant Marine Act of 1920,” in Brian K. Landsberg, ed., Major Acts of Congress, vol. 2 (New York: Thompson-Gale, 2004): 267–270; Clinton H. Whitehurst, Jr., The U.S. Merchant Marine: In Search of an Enduring Maritime Policy (Annapolis, MD: Naval Institute Press, 1983); and Clinton H. Whitehurst, Jr., The U.S. Shipbuilding Industry: Past, Present, and Future (Annapolis, MD: Naval Institute Press, 1986). 33Hearings on the Subject of the Improvement of the Louisiana and Texas Intracoastal Waterway from the Mississippi River, at or Near New Orleans, LA., to Corpus Christi, Tex., held before the Committee on Rivers and Harbors, House of Representatives, 69th Congress, 1st sess. (19 and 23 March 1926): 52. 34In fact, Lazaro’s obituaries list his work on the canal as one of his prime legislative accomplishments. For example, see “Dr. Lazaro, Dean of Congressmen, Dead at Capital,” 31 March 1927, New Orleans Times-Picayune: 1. 35See a history of the Gulf Intracoastal Waterway in The Handbook of Texas Online, http://www.tshaonline.org/handbook/online/articles/ GG/rrg4_print.html (accessed 7 October 2009). 36Congressional Record, House, 65th Cong., 2nd sess. (17 December 1917): 469–470. Louisiana eventually became the 14th state to ratify the amendment, on 3 August 1918. 37See the roll call tallies for both dates: Congressional Record, House, 65th Cong., 2nd sess. (10 January 1918): 810; and Congressional Record, House, 66th Cong., 1st sess. (21 May 1919): 93–94. 39Congressional Record, House, 69th Cong., 2nd sess. (29 January 1927): 2578. 40See House Rpt. no. 1886, “Conference Report on Regulation of Radio Communication,” 69th Congress, 2nd sess. (27 January 1927): 1–19. For a history of broadcast regulator acts, see Robert W. Van Sickel, “Communications Act of 1934,” in Brian K. Landsberg, ed., Major Acts of Congress, vol. 1 (New York: MacMillan/Thompson-Gale, 2004): 142–146. 41“Dr. L. Lazaro Dies in Washington,” 1 April 1927, Clarion-Progress (Opelousas, LA): 1. 42“Representative Lazaro,” 31 March 1927, New Orleans Times-Picayune: 8. 43Congressional Record, House, 70th Cong., 1st sess. (13 May 1928): 8592. Papers: 1894-1929, 6,235 items, 43 volumes. Collection is personal, business, and congressional papers and correspondence, photographs, and memorabilia. Includes copies of political speeches, House bills, government reports, political broadsides, correspondence pertaining to state and local political campaigns; his interests in agriculture and the tariff questions related to the rice industry are reflected. Records of medical practice. Finding aid in repository. Papers: In the papers of the Fontenot family, 1834-1949, n.d., 0.3 linear foot. Collection includes letters from Lazaro regarding his candidacy for the Senate and a local political race. "Ladislas Lazaro" in Hispanic Americans in Congress, 1822-2012. Prepared under the direction of the Committee on House Administration by the Office of the Historian and the Office of the Clerk, U.S. House of Representatives. Washington: Government Printing Office, 2013. United States. 70th Cong., 1st sess., 1927-1928. House. Ladislas Lazaro. Memorial addresses delivered in the House of Representatives of the United States in memory of Ladislas Lazaro, late a Representative from Louisiana. Seventieth Congress, May 13, 1928. Washington: Government Printing Office, 1929.